The band he’s referring to is Tuba Skinny, a collection of New Orleans street musicians that, since forming in 2009, has become a favorite on jazz festival circuits and scored several international tours, despite forgoing many of the advantages the recording industry is supposed to provide to up and coming bands. No manager. No label. No benefactor. And for Tuba Skinny, no problem. And for Tuba Skinny, that ability to move at their own pace and determine their own course is central to their ethic. At a time when an artist like Chance the Rapper can become one of the most important voices in American music largely by self-producing his work, it shouldn’t be surprising that other bands have found success using the do-it-yourself model. What makes Tuba Skinny’s version of the story unique is the style of music they play and, especially, their ideal venue: The street. Any street. While many musicians cut their teeth playing on the street, the member of Tuba Skinny have made it the anchor of their musical lives. That’s not unusual in New Orleans, where parades and roving brass bands are so much a part of the city’s character that the city issues guidelines to visitors on how to obtain parade permits. But the fact that their street performances have translated to success outside of the band’s adopted hometown is very much a product of today’s technology. Luck might explain some of the success — for example, the band claims to have booked an entire tour to Australia simply because the organizer saw their videos online — but it can’t explain all of it. Bien-Kahn points to the efforts of singer Erika Lewis and cornetist Shaye Cohn to book gigs and tours. Rapuzzi points to the band’s work ethic and constant hunger for new material, which has produced eight albums in as many years. Gaining success through videos other people take might say a lot about the role technology plays for bands today, but it also says a lot about this particular band. Still, despite club gigs in their hometown and a number of touring dates, the band’s home venue remains any number of corners on Royal Street in New Orleans. Their street setup is simple, and uses no amplification. The band arrange themselves in a half circle, with Shaye Cohn, clarinetist Craig Flory and trombonist Barnabus Jones (usually with his dog, Tupelo, at his feet) on one end, and the rhythm section (consisting of guitarists Greg Sherman and Max Bein-Kahn, banjoist Jason Lawrence, washboard player Robin Rapuzzi, and tuba player Todd Burdick) on the other. Erika Lewis recently moved from New Orleans, though she still tours with the band. When she’s performing with them, she can usually be found dead center, sitting on her bass drum as she sings. Surrounding the band will be a variety of onlookers, occasional dancers, and lots and lots of cell phone cameras — devices at once crucial to the band’s success and a wall that keeps some of the viewers at bay. The in-the-moment quality of their street performances even translates to their videos. Do a search for performances by the band and you will quickly find a couple hundred videos of varying quality and length. The lineup of the band changes, depending on the year. The size of the room and the quality of the sound vary. Sometimes a police car or dancers or an overeager onlooker will wander into the frame. The music and the setup might go back a century, but the surveillance-video nature of the recordings is very much a product of the technological age. It’s this clashing of the old and the new that is at the heart of the band’s journey. Many of the songs they are playing come from the dawn of the recording industry, and many of musicians — whose backgrounds range from classical piano to punk rock — learned to play it by listening to those old recordings. This is of particular interest to Bien-Kahn, who has served as a sound engineer for the band since recording and mixing their award winning 2014 release Owl Call Blues. His goal has been to transfer the energy the band gets on the street into the recording studio without losing sound quality. And there it is again — the old meeting the new. Modern recordings mixed with old-time sounds. A do-it-yourself ethic as old as performance theater, and a massive publicity machine in the form of the Internet to keep it alive. And in the center of it, a band that sets up wherever they see fit, puts out the tip jar, and dictates success on its own terms. More information on Tuba Skinny can be found at their website. 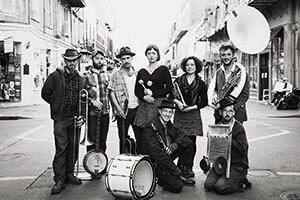 Formed in in 2009, Tuba Skinny has steadily evolved from a loose collection of street musicians into a solid ensemble dedicated to bringing the traditional New Orleans sound to audiences around the world. Drawing on a wide range of musical influences — from spirituals to Depression-era blues, from ragtime to traditional jazz — their sound evokes the rich musical heritage of their New Orleans home. The band has gained a loyal following through their distinctive sound, their commitment to reviving long-lost songs, and their barnstorming live performances.